5miles Dash – Bid on new items shipped right to your door! 5miles Dash is now LIVE! 5miles Dash is a quick bidding platform that sends brand new items, at low prices, right to your door! Bidding starts with a pre-determined opening bid amount. You can then place subsequent bids in real-time, increasing the price. You will only pay when you’re the winning bidder on an item in a live auction. Visit our Help Center to learn even more about 5miles Dash! BID $_ means you can place a bid for the item at the price indicated. OUTBID appears if someone has outbid you. You can try bidding again at the next increment. WINNING appears when you’ve successfully placed a bid and you’re currently the highest bidder. Keep an eye on the item to make sure no one outbids you. If they do, you can bid again at the next increment. The progress bar under the button is a countdown showing how much longer the item will be accepting bids, along with “Going Once”, “Going Twice” notices to place another bid. Congrats, You’ve Won appears when you’ve successfully placed the highest bid and won the auction. SOLD means that item has been won by the highest bidder and it is no longer accepting bids. RESERVE NOT MET means the item had a reserve price which was not met, and the item did not sell. The next item will appear shortly. CLOSED means the bidding time ended without a valid bid being placed and the item did not sell. The next item will appear shortly. We are so excited to share this new feature with our fellow 5milers! To keep up with our latest updates or ask us any questions, leave a comment below and find us on Facebook, Twitter, and Instagram! *5miles has the right to remove any participants from receiving credits or using 5miles Dash in the event that a policy was not followed. How can I sell new items on 5Miles Dash? 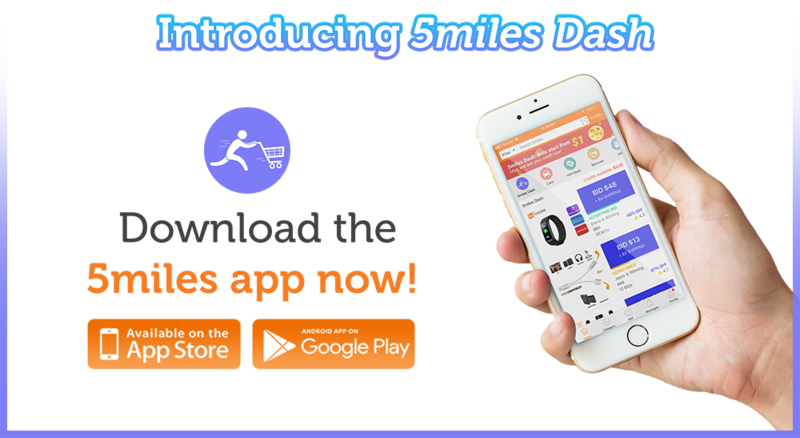 5miles Dash is a pretty new feature and we are using a few selected vendors at the moment. We will be sure to announce when our users can start posting items on 5miles Dash! Hopefully, from there you can find your tracking number!